With the “demise” of the euro now hitting the national mainstream media it is inevitable, of course, that the eurodollar will reverse as currency traders and speculators are castigated once again for placing huge short bets on the euro falling further. My own analysis on the recent fall goes back to the start of the decline in early December when we saw a major shift in sentiment in the COT data with a transition from net euro long positions to net shorts by the big boys, always a good indicator of future direction. Yesterday’s candle was interesting as it provided an “inside day” signal with the price action confined to that of Friday’s candle suggesting that we may see a short term reversal which was set in train in overnight trading in Asia. Part of the reversal was also due to a mild rebound in Chinese equities which was reflected in a bounce back in the EURJPY as traders appeared to regain a modicum of risk appetite. 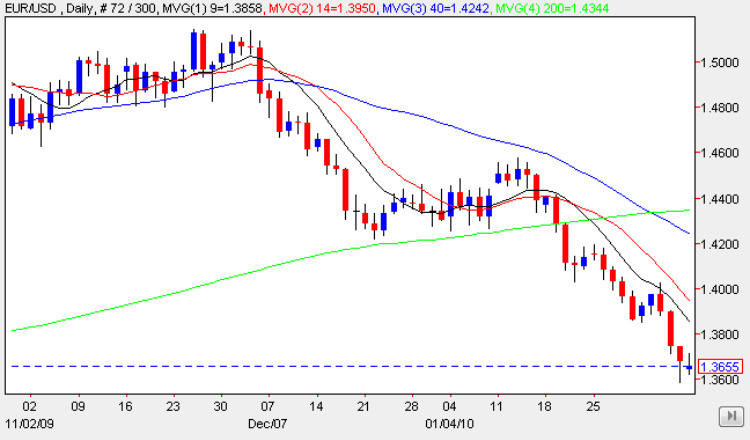 From a technical perspective, in the short term, the 9 day moving average may present a barrier to any move higher and although prices could rally to USD1.38 they could stall at this level approaching this average coupled with minor resistance in this price region. The overall picture in the medium term remains firmly bearish and therefore any upward move in the euro vs dollar should be seen as an opportunity to enter further short positions. The only item of fundamental news on the economic news for the euro vs dollar has been the German Trade Balance figure which came in at 16.7bn against a forecast of 14.8bn. Greece urged to teach speculators a lesson! Is the Euro Set to Rise? What is the cost of euro disunion?